Femputer: That does not fempute! Nintendo has done it again. Going back to a formula that has worked since the creation of the Nintendo Entertainment System, Mario is once again back to rescue the Princess from the likes of Bowser. Keeping in line with the original Nintendo games, New Super Mario Bros. is a side scrolling adventure pure and simple, but that’s part of what makes it so fun. Not that games like Super Mario Galaxy aren’t great additions to the series, its fun to jump back into a modern take of an old classic. Don’t think though that the game doesn’t pack any surprises though. As usual there are a few new items, such as the propeller mushroom that gives the player a beanie hat like propeller that can launch Mario and his team high into the air, only to slowly and humorously awkwardly come back down to land. There is an option to spin quickly down as well to hit enemies below with a powerful strike. Other new items include an ice flower that allows Mario to freeze enemies into blocks and either break them, jump on them or smash them into other enemies, and a penguin suit that gives ice flower abilities as well as better traction on ice, and better swimming… just remember penguins can’t fly! You may have noticed my use of the phrase Mario and his team… and that’s because the game offers a co-op mode with up to four players. Depending on your play style this can be either really fun, working with one or more partner clearing goombas and jumping over obstacles, but it can also be really frustrating, with everyone jumping all over each other trying to get places first… not that a little competition is a bad thing, but it can make already challenging levels that much more difficult. I played through a good portion of the game with a single partner, and the two of us would utilize different power ups to make us a little more rounded in abilities, and even took turns carrying the other through tricky areas to prevent an errant jump from knocking someone into a pit of lava or a field of spikes. For those that want a little more competition there are both coin battle and free for all matches to be played with two or more players. 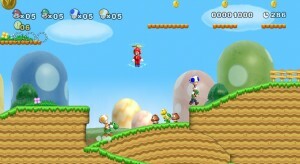 For those joining in, other playable characters include Luigi and two different Toads. 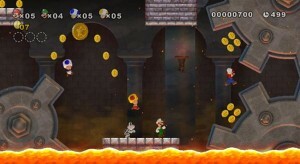 The play style is very reminiscent of Super Mario Bros. 3 with a world map that culminates with a castle and/or airship. There is also a dash of Super Mario World thrown in for good measure, with secret exits on some stages to either get to shortcuts or warp cannons scattered throughout the board. Yoshi also makes a cameo in a few levels, though finishing the stage with Yoshi won’t let you take him with you as in Super Mario World. Also, each level has three star coins to collect, which can then be used to purchase hint videos at Peach’s Castle in the first world. These videos can be used to show secret level exits, as well as guides for each of the levels. In order to purchase the videos one needs both the coins, and to complete the prerequisites such as finishing levels, or collecting all the star coins in different levels. All in all, I give the game 4 out of 5 geeks. Good quality fun, both solo and with friends, though sometimes just a little lacking compared to a game like Super Mario World that had huge depth. Difficulty can be very challenging at times which is nice as it helps draw back older fans that played the other games in the series when they were younger. Definitely one of better games to come out for the Wii lately, and a must have for fans of the original Mario side scrolling games. It is perfect that we are able to receive the loans moreover, this opens new chances. Thanks mate. Great site you got going on here. Got some more links to point to which have a bit more info?